Meet Peter John (centre picture). He volunteers at Made In Hackney as a class host supporting our teachers to deliver cookery sessions. He’s currently living in a hostel and due to suffering from debilitating arthritis in his legs and ankles is unable to work. 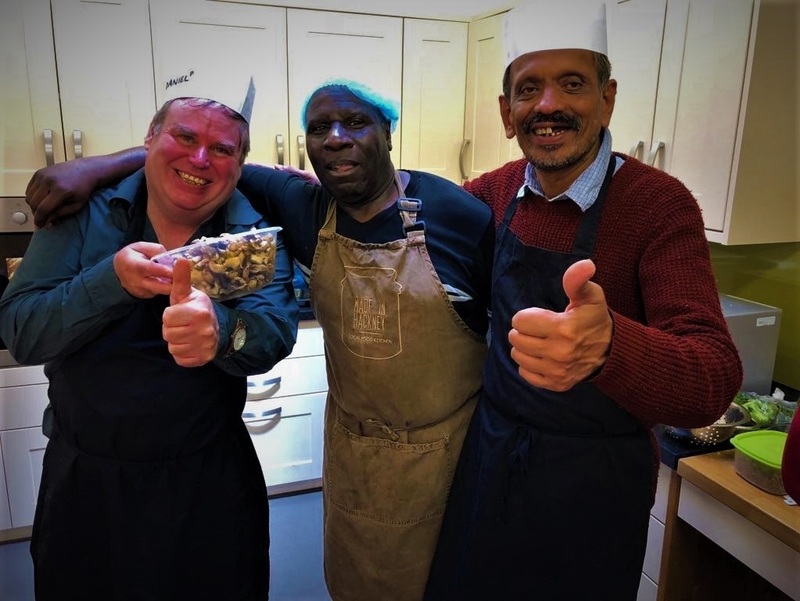 He says volunteering at Made In Hackney has, “Given me the opportunity to get out there and get my life into some sort of routine again.” As a former chef with Health & Safety qualifications and a natural ability to get on with people – we’re lucky to have him. Our founder Sarah Bentley chats to him about his experience volunteering with us. Sarah: How did you hear about Made In Hackney? Peter: I was taking courses at Providence Row – a charity that supports homeless people. I did different courses – wellness, IT, cooking. When I finished all the training they recommended Made In Hackney to me. Even if I’m not well enough to work – I get fed up doing nothing. With a job if you don’t go because your ankles and legs are not up to it you’ll get fired. With volunteering you can do it as and when you can manage. Sarah: What classes have you volunteered at? Peter: All sorts. A 6 week cookery course with young people from a special needs school. Another 6 week course with adults with special needs. One course with Age UK. I’ve also volunteered at some masterclasses – Middle Eastern Cuisine and Homemade Cosmetics. And a parents and kids class held during the holidays on a local estate. Sarah: Wow. You’ve done a lot for us. Thankyou. How you finding it? Peter: I’m loving it. You meet different people and learn about food at the same time. On the cosmetic class I had a bit of a culture shock as I was the only man on it but they made me feel very welcome. It was fun. It’s helping me in all sorts of ways. Peter: Socially – meeting different people each time. Saving money learning how to cook different vegan recipes. It’s good for your mental health. The classes are always happy affairs. Standing up in front of a group of people you don’t know and talking. I have a bit of problem with that but I’m doing it again now. Made In Hackney’s given me that opportunity. It’s funny as I was always one of those people that said they’d never volunteer. Peter: Yeah. I’m so glad I’m doing it now. It’s got me out and made me do things I wouldn’t normally be doing. Meeting people I wouldn’t normally meet. I’ve never had a problem with anyone in any of the classes. Sarah: Not even people being resistant to all the veggies? Peter: Ha well yeah a bit. The young people who came from the special needs school we’re quite challenging at times about that. But it was still really enjoyable...The little kids at the family event loved all the food – it looked very colourful and I think little ones – well everyone – we eat with our eyes often don’t we.... my friends and family are interested in what I’m doing here. My brothers Mrs had cancer and she was advised to go vegan so I’m sharing ideas with her. After she saw my post about the Middle Eastern class she asked, “When you coming round?” It’s good to share what I’m learning. Sarah: Thanks so much Peter. You’re a legend!